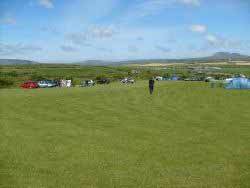 BrynCelyn Uchaf is a small friendly family run campsite,catering for Familiy's,Couples and Small Groups. Set in the welsh countryside in an area of outstanding natural beauty. We are 1.5 miles from Abersoch,Close to Beaches,Golf Course,Horse Riding,Fishing and Walking. We are surrounded by Abersoch Main Beach (20 minute walk), Porthceriad Beach (5 minute walk) and Hells Mouth (5 minute car ride). We are a 20 minute walk to Abersoch Village. The Campsite is equipped with Toilets,Hot Showers,Hand Basins and Dish Washing Facilities. Taking bookings for wakestock 2011. Near Abersoch - a sandy composition 1.4 miles away. Near Abersoch - a sandy and pebble composition 1.4 miles away. the head of the beach is comprised mainly of pebbles though good large areas of sand appear as the tide recedes. Near - a sandy composition 1.7 miles away. Near Abersoch - a sandy composition 4.3 miles away.